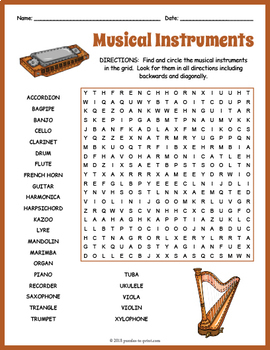 Your students will enjoy looking for all of the musical instruments hidden in this fun puzzle worksheet. The words are hidden in all directions and there may be some overlaps making this a challenging word search. A great activity for early finishers or just for something fun to take home and enjoy. The 27 hidden vocabulary words are: accordion, bagpipe, banjo, cello, clarinet, drum, flute, french horn, guitar, harmonica, harp, harpsichord, kazoo, lyre, mandolin, marimba, organ, piano, recorder, saxophone, triangle, trumpet, tuba, ukulele, viola, violin, and xylophone. We love FEEDBACK! And you earn CREDITS! • Log in to your Teachers Pay Teachers account. • Click on the drop down menu “My TpT”. • Choose ratings and leave feedback. Puzzles to Print guarantees you the highest quality crosswords, word finds, cryptograms, Sudoku and number puzzles available.